As technology advances, devices become lighter and more compact. With the Ollin monitor arm, you can support a range of monitors of various weights. The arm has a wide range of motion, allowing you to position screens wherever makes you most comfortable, encouraging a healthier posture whether you’re sitting or standing. Complete with desktop mount clamp. Estimated delivery from 5 working days. Ollin can support a range of monitors weighing up to 9 kilograms. You won’t need any tools to adjust the arm because it has an integrated thumbwheel adjuster, making it a hassle-free solution for screens of various weights. With Ollin’s wide range of motion – horizontally 674 mm and vertically 346 mm – you can position your screen at a comfortable spot based on where you’re sitting or standing, bringing the monitor to you and not the other way around. Ollin’s tilt range, up to 80 degrees rearward and 10 degrees forward, prevents your neck from craning and your shoulders from hunching – creating a healthier posture that can lead to increased productivity. The range of motion and tilt range are also ideal for touch screens and helpful for those with progressive lenses. The easy cable management system is integrated into a 3-point format to create a neat and tidy workstation. 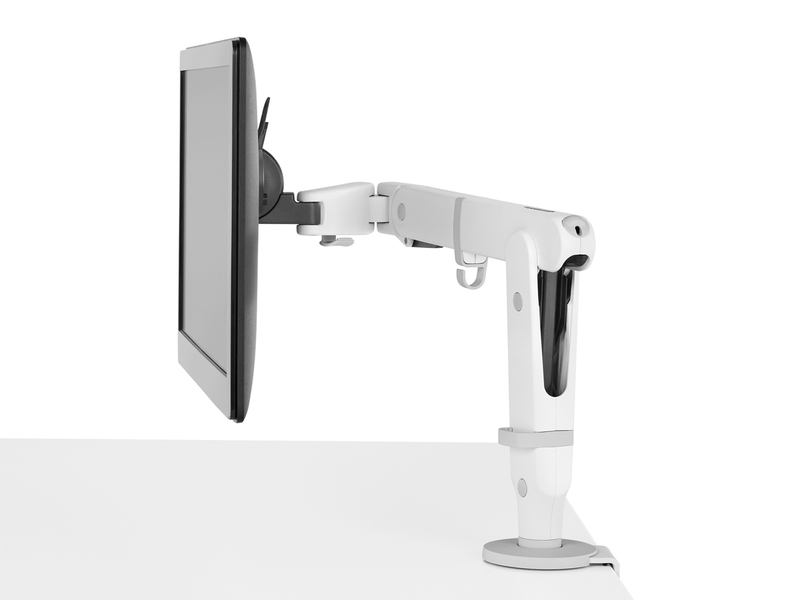 Designed by Colebrook Bosson Saunders, this dynamic monitor arm changed the game in ergonomic support as no other product on the market can accommodate tablets, monitors and laptops in the specified weight range. According to CBS, “As technology develops and allows us to interface with it in a more dynamic way, we need products that can do the same. Just as clever software requires no knowledge of the program to make it work, we wanted to create a solution that floats just where the user wants and adapts intuitively to be touched, shared and used dynamically. Good engineering, minimal parts and a responsible design using renewable materials create a product that people value and can use for a lifetime”. Suitable to desk thickness of 12-25mm.